The short version is that Rock Taxi was established in 2008, initially as Hard Rock Taxi and later renamed Rock Taxi in 2010. From having one car in 2008, the company has gradually expanded to now have 3 vehicles and 6 employees. Besides that founder Leiv Kåre Larsen has always been interested in music and had an urge to do things his own way, we must go back to 2005 to find the origins of Rock Taxi. After a few years as an employee, Leiv Kåre wanted to start for himself. The car, a VW Touran, was ordered with the main audio package VAG delivered. This proved however to not have the punch that Leiv Kåre wanted, and the first visit to Bilradiospesialisten was done, but only with a price offer as a result. At the end of 2008 and beginning of 2009, the financial crisis hit the taxi industry. The market went down and it was battle for customers. Leiv Kåre had two choices, either to give in or fight for the customers. The price offer from Bilradiospesialisten was retrieved, and he headed to the accounting department. They pointed out, however, that this could not be approved as such an audio system was not necessary in a cab. In other words, it had to be proved that it was necessary so that it could be approved by the accountant. 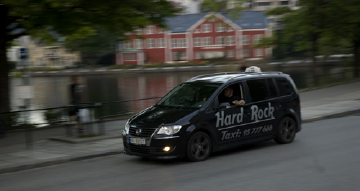 The sum of the financial crisis hit, the original audio was too poor in the car, and that the accountant didn’t approve the new soundsystem, made the firm change its name from boring Leiv Kåre Larsen Taxi to Hard Rock Taxi. The accounting department was not quite satisfied, despite it “only” was 30,000 kr. The registered number of the company was quite fiddly, and thanks to an acquaintance in Telenor it was provided 22 different phone numbers that were considerably easier to remember. It ended up with 95 777 666. Rått Design put on the logo, company name and number on the car. And little by little, the name got more known and people began to call. In spring 2009 Hard Rock Taxi was interviewed by students at UIS. In the summer of 2009 Hard Rock Taxi was interviewed by TV2 and it aired national on the 21news. In autumn 2009 Leiv Kåre asked to give a lecture to students at UIS on marketing strategy and tactics. Winter 2009 Hard Rock Taxi was interviewed by NRK Rogaland. It aired for a week on local TV, and NRK chose to send the entire clip plus more on the popular show Norge Rundt. The spring of 2010 was the end for Hard Rock Taxi. Hard Rock Café had seen the topics and threatened with court if the name and logo wasn’t changed. Instead of going to battle against a great company, despite the car logo was presented to the Hard Rock Cafe Oslo in spring 2009, Leiv Kåre decided to change everything. The current logo was after all just copied from the Internet and the text had many similarities with the Hard Rock Café. 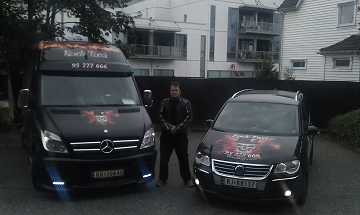 Leiv Kåre went along with two acquaintances and drafted, sketched and designed a new custom made ​​logo and the name was changed to Rock Taxi. Thanks to great media coverage, customer recommendations and lot of work, Rock Taxi became quite popular. The stereo system had gone from only 30,000 to over 100,000 – and the accounting department had to accept that it was now necessary. In 2011, VW Touran retired in favor of a bigger car, a Mercedes Benz Sprinter 2011. The logo and company name was refreshed, and it’s the logo that is on the cars today. In 2013 Rock Taxi inherited a new license and reintroduced the former retired VW Touran, until 2014 when it was replaced by a Toyota Prius. VW Touran is still in business but no longer operates as an ordinary taxi. 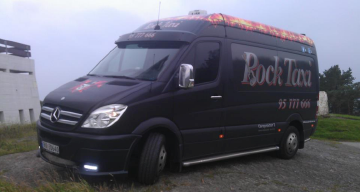 In 2014 Rock Taxi achieved another license, and a new and even larger Mercedes Benz Sprinter 2014 was put into operation. Music has always been the focus at Rock Taxi and the cars’ sound systems have continually been expanded. Likewise, it has also been invested in better comfort, seats, lighting and air conditioning. The company is still growing, and there are plans to invest in a limousine and coach. It must however be in line with the economy, employees and customer contracts. We will immediately thank all our loyal customers who have made this development possible! 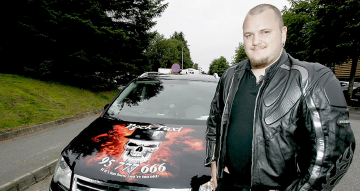 Leiv Kåre, b., 1983, started driving taxi in 2005, and started Rock Taxi in 2008. Raised and living in Stavanger, attended St. Svithun VGS and very interested in music. He has worked in several service occupations previously, and the combination of interests like music, driving and working as a taxi driver resulted in Rock Taxi.